BackupGenie’s automated online backups make data protection surprisingly easy and painless. Backing up to the cloud has long since surpassed optical media and external storage devices as the quickest, most convenient and most affordable way to back up your data securely. This online storage solution enables you to easily protect your computer using a simple desktop application that runs in the background while you work. Schedule your backups to run when you’re not working to reduce bandwidth, then access those backed up files from anywhere you please. 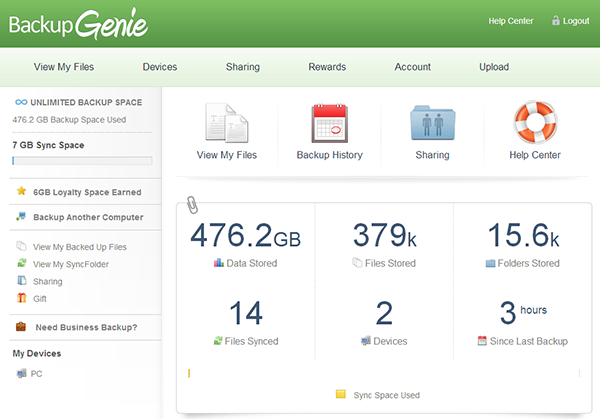 BackupGenie has developed an intuitive desktop application that simplifies the backup process. Automated online backups mean that once you have set up a backup schedule, you don’t have to do anything else to ensure that your data is being securely stored in BackupGenie’s cloud data centers. Familiar features such as drag-and-drop make backing up files and folders a user-friendly process and the user interface isn’t cluttered or complicated, and instead uses a simple, intuitive design that novice users can easily master. You can ensure the availability of your documents across multiple computers through the MyPCBackup Sync folder. Install the desktop application on any computer that you would like to give file access to and the Sync folder will automatically update the folder with documents that have been previously backed up. There is also no file type limitation, so any file, document or executable that resides on your computer can backed up, synced and accessed using a wide array of devices. BackupGenie uses Google Cloud Storage servers to store and replicate your data across multiple data centers for added security. During the transfer of data from your computer to the data centers, BackupGenie uses a 256-bit Advanced Encryption Standard (AES) to protect your data from being breached. AES essentially encrypts the data using a highly complex data key during transfer and uses this safeguard so that only you and those you share your files with have access. This industry-leading technology is used the world over by military and financial institutions alike to securely transmit data. Additionally, BackupGenie offers resources through their online community via their social media accounts. Simply ‘Like’ BackupGenie or follow them on Twitter to gain access to a large community of BackupGenie subscribers and users for assistance. As opposed to traditional backup solutions where your data was backed up to optical media such as CDs, DVDs and external drives, BackupGenie uses cloud storage to secure your data. Cloud storage not only provides you with a more secure storage solution due to the many safeguards for their data centers; it also provides wide-ranging accessibility for files using almost any device with an Internet connection. Being able to download any file on any PC, laptop, smartphone or tablet from anywhere in the world makes BackupGenie a wise choice for your storage needs. BackupGenie provides access to previous versions of your files for up to seven days. Protects your iTunes library and Outlook’s archived emails. Share files and folders with friends, family and co-workers via BackupGenie’s robust sharing features. BackupGenie offers different plans that vary depending on your storage demands. The following pricing is based on their two-year plans. Cloud storage has been a game-changer for the backup industry. Companies such as BackupGenie have taken advantage of its speed, efficiency, convenience and affordability by offering their customers a simple and inexpensive way to protect their data. And thanks to the implementation of advanced encryption methods like 256-bit AES, you can back up, restore and access all of your files over the Internet without having to worry about eavesdropping or tampering. BackupGenie provides everything you need to ensure the safety and availability of your computer’s data while being able to download it on the road via smartphone, tablet or laptop. Flexible backup plans mean that you can choose an appropriate strategy to make data protection not only automated, but affordable as well. With online storage solutions like BackupGenie around, there really is no excuse for not backing up your data.